Our last day of our Saugatuck vacation started pretty early…at least for us. We had to be out of our cabin by 10:00 AM, so at 9:00, J woke me up and we loaded up the cars and said bye-bye (or da-da as L says) to our cabin by about 9:40. For a while, we had talked about going in to Grand Rapids and spending the day, but we were all pretty tired from the week and just wanted to get back to familiar surroundings so we decided to head home. As we were getting in to the cars, I asked if we could get some breakfast first. J said she was hungry and since (of course) there was a place I wanted to eat just down the road, we were going to breakfast. 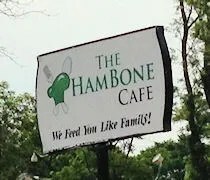 I first heard of HamBone Cafe on Terry’s Blog a couple of months ago. 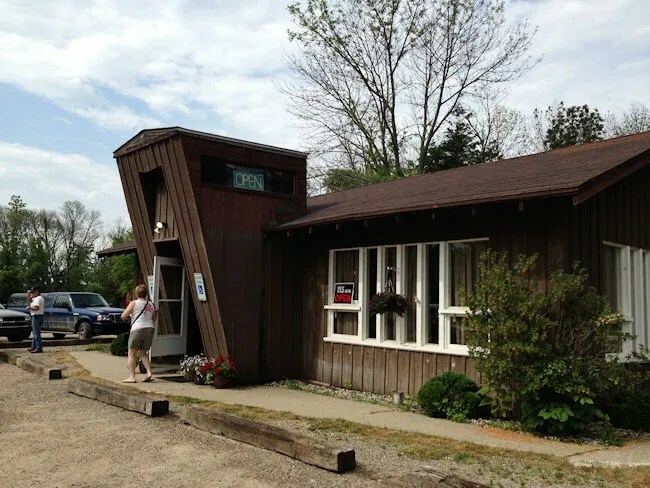 The small restaurant is south of M-89 on Blue Star Highway outside of Fennville. I actually thought it was a little closer to M-89 than it actually was, but it’s a pretty short drive from I-196. We pulled up around 10:00 and found a pretty full parking lot. When we got in the door, we found HamBone Cafe to be the meeting spot for area farmers. The place was full of older men in John Deere hats and more came in joining the conversation as the morning wore on. I spotted a four top near the back of the open dining room and headed that way with L. A waitress saw me heading that way and grabbed a high chair for her along with menus for the rest of us. J’s mom had already eaten breakfast, so she was there more just because we were hungry. Still, she ordered herself an English Muffin to snack on and a cup of coffee. For J and I, there was a lot on the menu that sounded fantastic which made our decisions even harder. I stuck with one of my usual breakfast choices. The Steak and Eggs. The steak is a 10 oz Ribeye I asked for medium and it came out closer to medium rare…which is fine with me. The tender, flavorful hunk of meat was just dripping in it’s own juices and had the crusty remnants of a well seasoned grill. The two eggs came out just slightly runny and perfect with the beef. 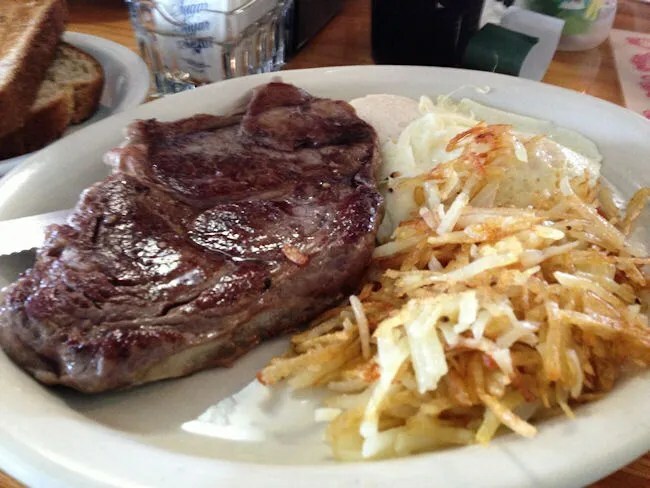 The hashbrowns were the surprising part of the meal to me. They were delicious. Very crispy all the way through. Hash browns are always so hit or miss with me and these were hits. J ordered The Griddle Combo. 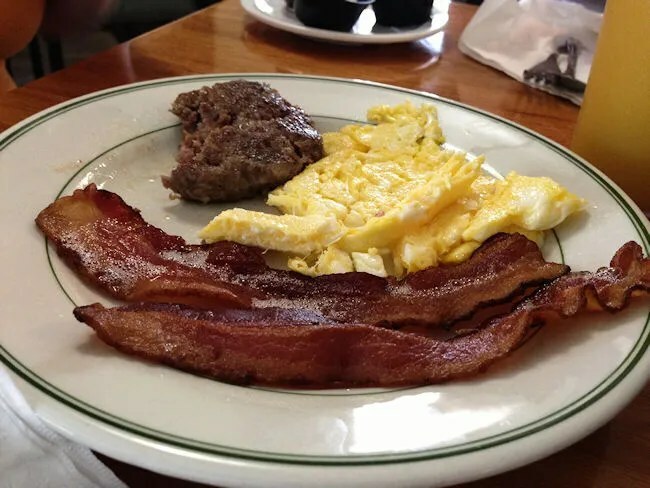 She got her two eggs scrambled to go along with the sausage patty, bacon and French toast that came with the meal. Her plan was to share with L, but all L was really interested in was the bacon which was very crispy…just the way J likes it. 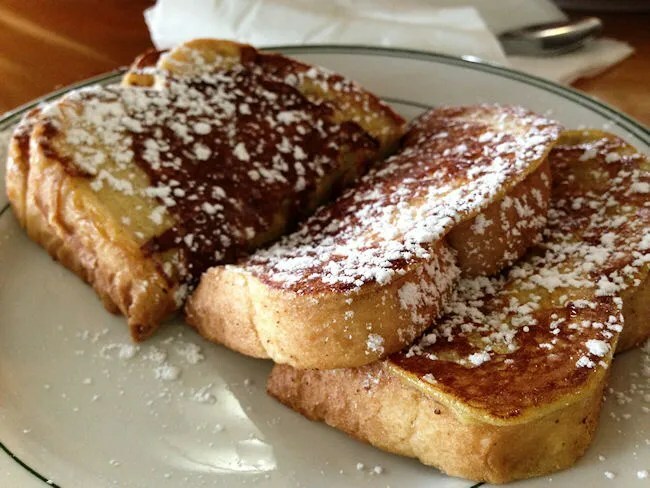 The French Toast came with a liberal dusting of powdered sugar on top of the thick, gooey pieces of Texas toast. To drink, L ordered an orange juice which she also tried sharing with L while we waited. Our bill was a little over $20 and before long, we were back on our way home. HamBone Cafe was a great breakfast stop and a great way to end our vacation. We did quite a bit of cooking at the cabin instead of eating out, so I didn’t get to as many new restaurants as I wanted to, but I’m glad we were able to hit this one up. It seems like a meeting place for the locals and with the down home cooking, it’s one of those spots you can’t go wrong with.